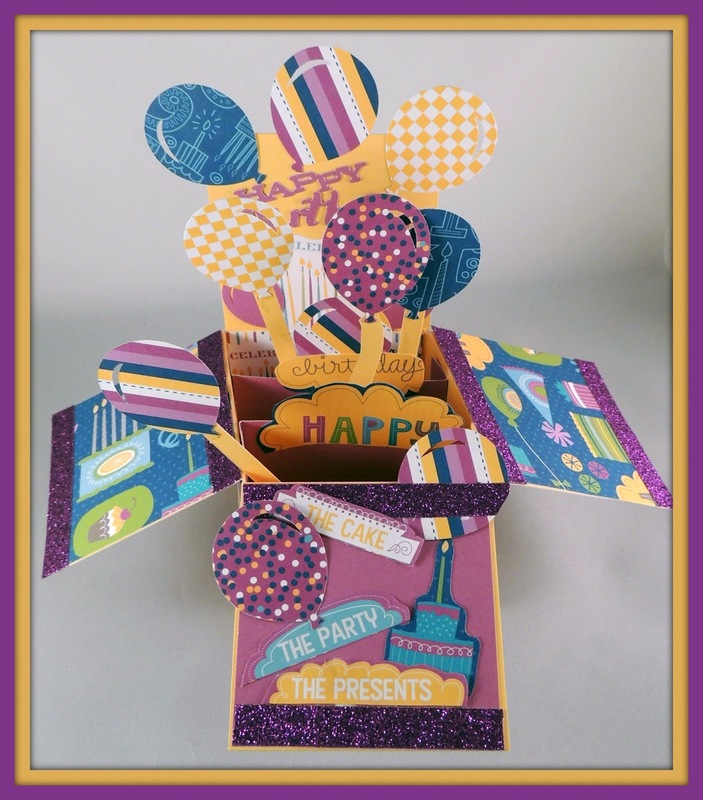 Dots Scrapbooking: Festive Confetti Papers make a fun Birthday or Celebratory Box Card! 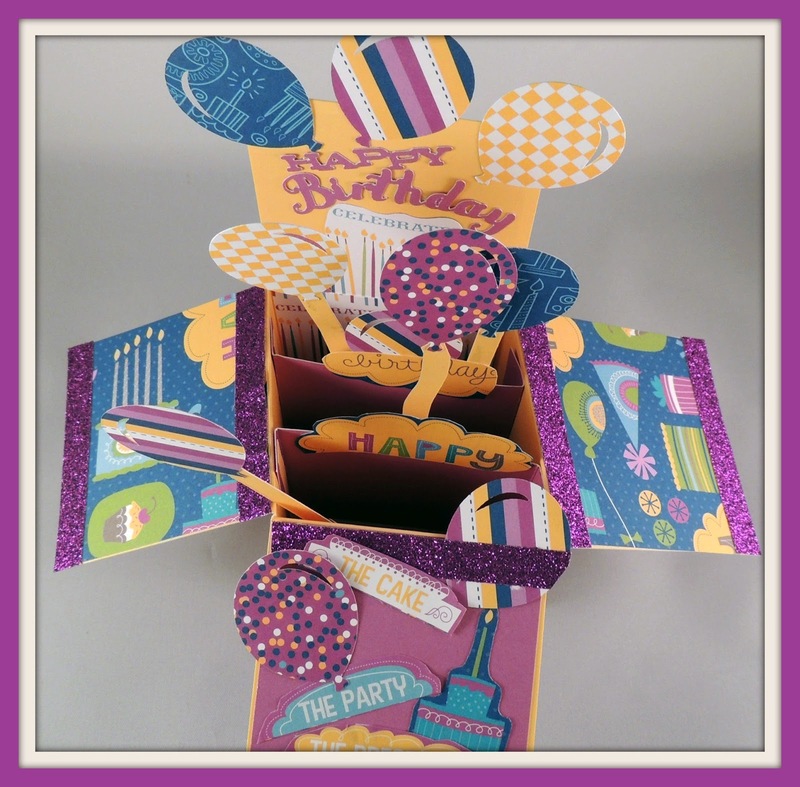 Festive Confetti Papers make a fun Birthday or Celebratory Box Card! Confetti Papers are so festive and are great for a girl or a boy! So, it's been icy, sleety, snowy and cold here and that means it's a great day for paper crafting! Here is my creation from yesterday, I could have vacuumed or done laundry, but this was decidedly more fun!! Remember, this box cards folds flat so it can go into an envelope. I will make that today with my Cricut. 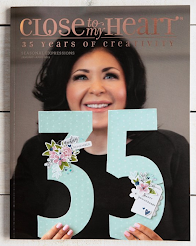 The balloons were cut using the Cricut and the Close To My Heart Artiste Cricut cartridge Z1790 at 1 1/2 inches. The paper is two-sided so 2 cuts=2 different balloons. On the front of the box I used our self-sticking Purple Shimmer Trim Z1919. Gots to have the bling! The cake, "Happy" in a cloud, and "birthday" was cut out from one of the 3 different print (CTMH calls background and texture-B&T for short). The words "The Party, The Cake, The Presents", were all cut off of a "zip strip" from one of the papers. All our B&T papers come with a 1/2 inch zip strip that can be used as a border or decoration. When the 1/2" strip is cut off the paper you are left with a 12 x 12 sheet. The side flaps are simply 2 pieces of Confetti B&T cut to a square 2 3/4" and trimmed with the purple Shimmer Trim Z1919. 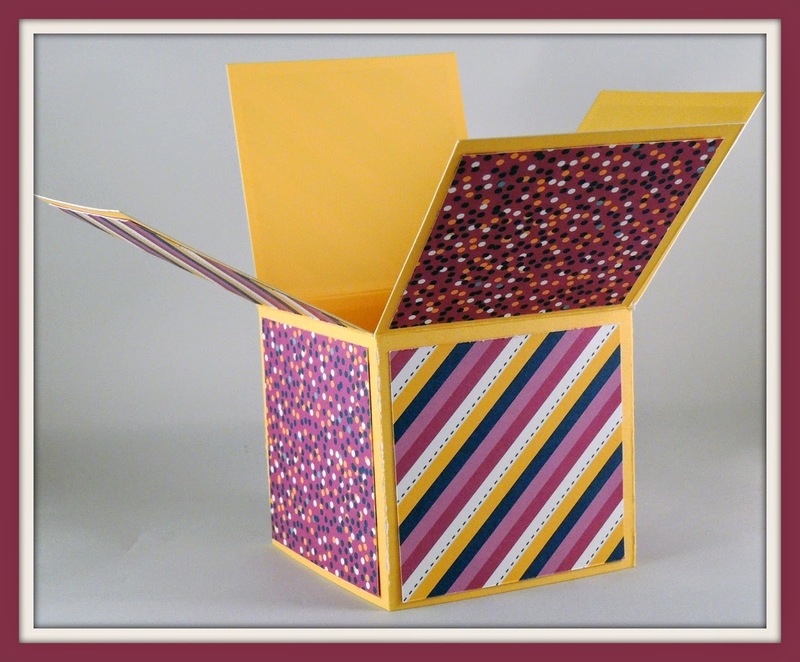 The box itself is cut from 1 of the 2 pieces of Canary cardstock the comes in the Confetti Paper Packet X7189B. The strip is 5 1/2 X 11 1/2". It is scored lengthwise down the middle at 2 3/4". Turning the piece, scoring to this center score at 2 3/4", 5 1/2", 8 1/4", and 11". Opposite from these scores, cut to the center, matching the cuts to the 4 scores. At the 1/2" end cut off the top 1/2" leaving the 1/2" score section in place. This is how I choose to decorate my sides. 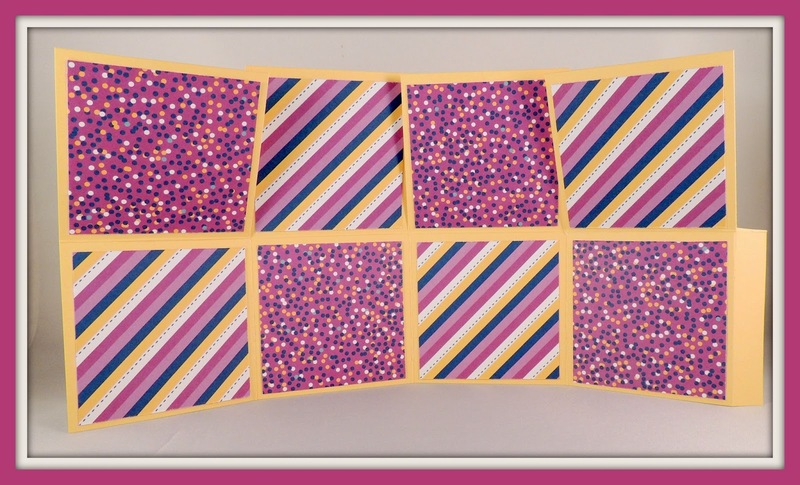 Cut 2 1/2" squares (8 pieces) and use your fave adhesive to glue them on. Fold along your score lines to make an obvious fold. Use your strongest adhesive to adhere the 1/2" flap to the inside of the opposite end of the strip. 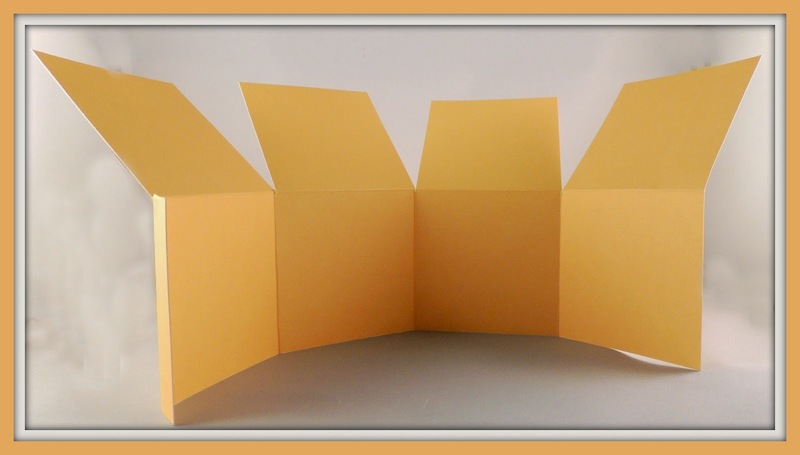 Cut 2 pieces of canary cardstock 2 3/4 X 3 3/4" and score 1/2" from each end in the same direction. Use strong adhesive to adhere both pieces on the inside of the box. 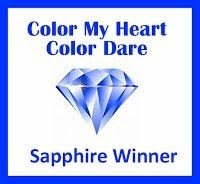 Decorate to your hearts content!! The Happy Birthday on the stand-up flap at the back of the box was cut from the same Cricut Artiste cartridge Z1790. The candles under that were cut from the other side of the side flaps. 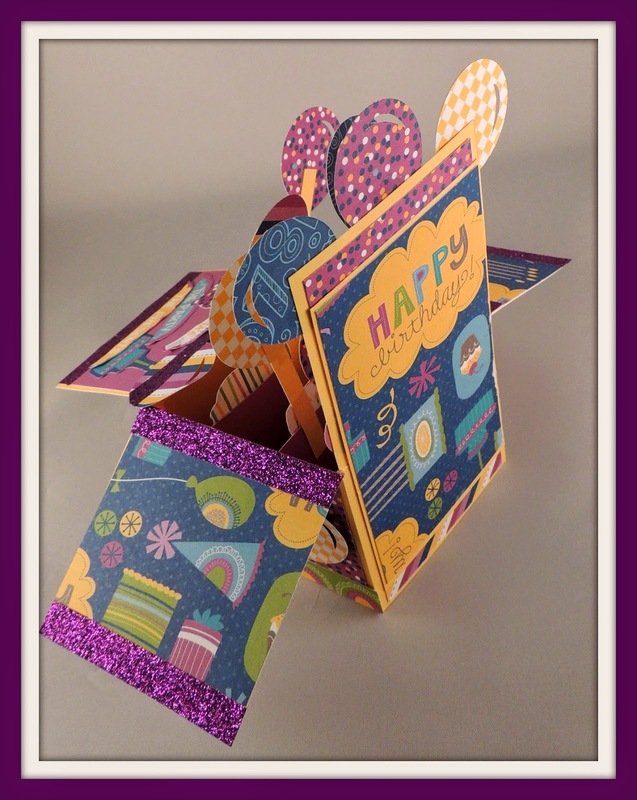 The balloons that stand up from the inside of the box panels were glued to 1/4" cardstock strips. You can glue whatever you like on the front and back of these panels. I reinforced the back of the box with a 2 1/2 X 5" decorated canary cardstock. Hope you find this helpful, but mostly something that would be fun for you to do!